A “Young Lady’s Illustrated Primer” is an interactive book in which a little girl Nell, learns critical thinking through a complex role playing game and adaptive story telling. Lacking both parents and teachers, Nell learns and masters not just topics like computer science and math, but ‘independent thinking’ in a playful way. At the back end of the wired Illustrated Primer, actors with Motion Capture technology play the book’s roles, drive the scenario’s and essentially feed Nell’s mind. This is the setting of a 1995 brilliant novel “The Diamond Age”. With the arrival of tablets this sort of interactive learning suddenly seems less futuristic, and kids everywhere lap it up. A friend told me his 18 month old daughter tried to flip the pages by stroking the cover of a magazine. The toddler was then surprised the pages did not automatically change. My then 9 month old daughter showed me how to enlarge pictures on the first generation iPad. A colleague told me the story of a kindergarten in Massachusetts where they put toddlers in foam pop-up corners with tablets to keep them engaged with eBooks and games. An university in Holland made iPads the institute's standard in delivering courses. The university writes specific apps for school administration, course schedules and general news sharing. A school in Belgium does away with ‘all school books’ and asks parents to invest in tablets to deliver all courses’ content on. The president of a professional soccer team bought his players tablets, with training content, strategies and interactive plays, to study. So what does this mean? Is there as shift happening in cultural behavior? I believe so. 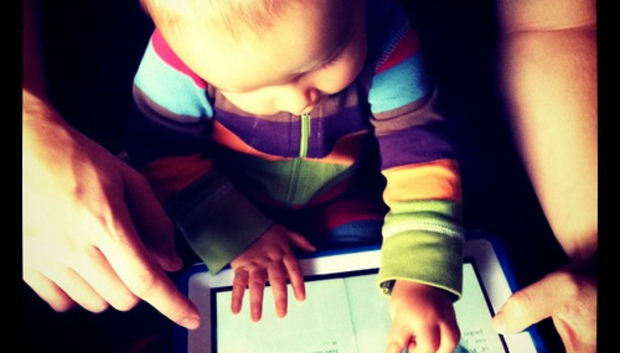 Tablets change the way how we consume information. This change in information consumption has been going on since the Middle Ages, where announcements were made on the town square. Then there was the printing press, telephone, radio, television and the internet. Each of these technologies caused massive changes in our behavior and culture. And riding on those shift, our culture changed, like the spreading of Protestantism through the mass printing of Bibles, or the birth of propaganda in German movies during World War 2, or circumventing the governments’ rigid behavioral standards by pirate radio stations broadcasting subversive rock music from the high seas, or Indian call centers supporting half the globe. And now there are tablets, offering a wealth of ways to consume information. When kindergartens, schools and professional sports teams shift from classic books to tablets, there is something going on. The star soccer player, for instance, might not have an appetite for dry books on effective team strategy, but he is probably motivated to learn when the strategies are delivered interactively on a tablet. Kids love tablets and the ‘swiping’, opens up new worlds for their inquisitive minds to explore, blurring the boundaries between books, movies, social media and games. Tablet establish two new things; more convenient access to information and new ways of delivering content. And these two things enhance our ability to growth, think critical and general develop ourselves broader, and from a younger age. It’s not just the technology that comes of age, but the critical thinking that accompanies this shift. And just like the printing press, radio, television, internet are concentric circles expanding the democratization of information, knowledge and intelligence, so I believe, tablets will be the next phase in making the world smarter and a better place to live in. … enter The Diamond Age. By Roel Castelein, GTM Strategy for EMEA, EMC.